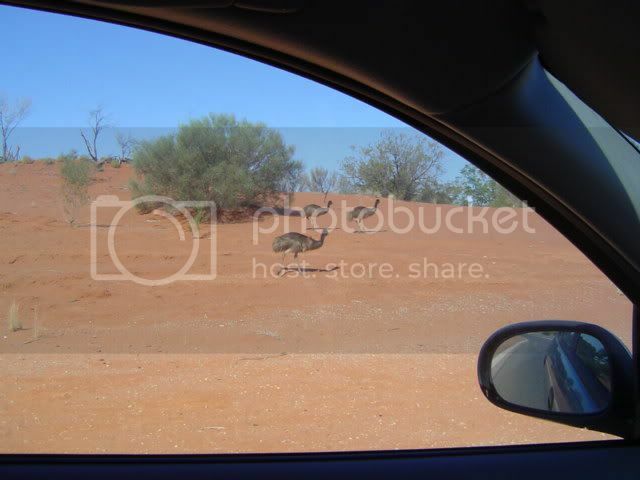 When it gets hot, emus come into town searching for water. We even get "Emu Alerts" in the local paper, warning us to keep an eye out for them, and to take care when driving around town. Not because running over an Emu is mean and sad, but because an Emu hitting your car does mored damage than you'd think. One of those long legged bastards will write your car off. I was driving around the other day, and came across a family of them near a roundabout. Thought you non-Australians would get a kick outta that. My first thought when I saw them was "Huh. Must be that time of the year again." My second was "Wait! I need my camera so non-Emu familiar people can see!"